When I was 8 years old I played the part of Scheherazade, a legendary Persian Queen and storyteller of One Thousand and One Nights in a school play. Since that time I have been fascinated with the exotic images and stories of that part of the world. With Sultans, and deserts and camels and such. Then 6 years later in 1962 (I was 14) along came the movie " Lawrence of Arabia" with Peter O' Toole and Omar Sharif, handsome men riding through the desert with white turbans flying... I was hooked! I really love the art and textiles that represent that part of the world, Eugene Delacroix a french painter spent time there and his paintings from that period are rich in color and details. I was fortunate enough to see the painting "Sultan of Morocco" in Toulouse, France several years ago.It inspired me to go to Morocco and see these things for myself. 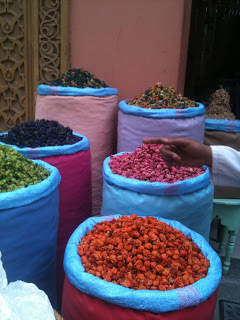 My time in Marrakech was brief, however, it was everything and more than I imagined it would be. I absorbed a lot , fascinated and mesmerized everyday and I continue to process the smells, sites , colors, images and sounds of this amazing city. 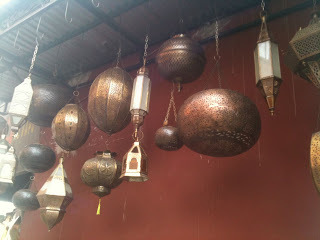 The Souk, was full beautiful items to purchase, everything is made by hand and sold directly to you. 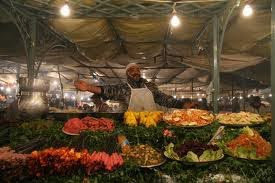 Leather goods, glazed tiles and ceramics, antique jewelry, Berber rugs, clothing and lots of food , like dates, olives , spices , local fruits and vegetables. Each small booth lined up side by side with some of the same items as the one before. The country sport is bargaining with the shop owners. They start high, you start low and you meet somewhere in the middle on a price.
" What's you best price , your best price,inshallah"
It was fun, but exhausting...I think the point is to wear you down. The Main Square, where everyone congregated in the evenings, was reminiscent of a county fair. 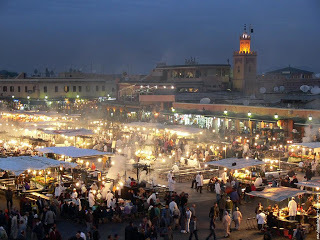 With smells of food as it was cooked fresh for you in a Tagine and the strange music of the snake charmers to mesmerize the cobras. ( I stayed away from this area). Groups gathered around belly dancers and small plays while all the youth rode their motor scooters around and around. Many people set up temporary displays of items to sell, similar to a garage sale. It was a montage of activities and sounds. The Streets are packed in the medina where we stayed. Cars, bicycles, motor bikes, donkeys with carts and horse drawn carriages...and of course, people! 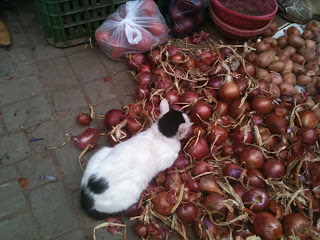 People walking, people talking, people selling and buying vegetables, meats, clothing, and home products. 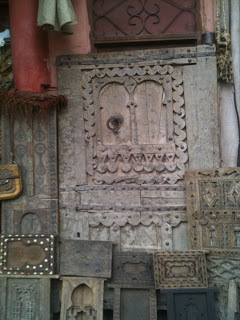 Along our path to the souks, we passed many small ateliers , where crafts people of all ages were making their wears. Beautiful rugs hung high on the terrace above me drying in the sun.